The American Colony in East Jerusalem is probably my favourite hotel in the world even though I have yet to spend a night there. Built in the mid-19th Century, it has thick walls, cool stone floors and discrete, hospitable staff, who ensure it remains an oasis of calm and tranquility. It began life as an orphanage. Horatio Spafford was a successful businessman in Chicago in the late 1860s, heavily invested in real estate along the shores of Lake Michigan. The disastrous Chicago fire of 1871 wiped out his assets. He helped rebuild the city and assisted many left homeless. In 1873 he arranged to take his family to Europe. Friends of D.L. Moody and Ira Sankey, they planned to attend their evangelistic meetings in England, then take a vacation. At the last minute, urgent business kept him home, so he sent his wife and four daughters ahead on the S.S. Ville du Havre, planning to soon follow. The night of November 22, 1873, the Ville du Havre, was struck by an iron sailing vessel, the Lochearn. The ship sank in 12 minutes. Of 273 people on board, only 47 survived. Mrs. Spafford was rescued, clinging to a piece of the wreckage. Their four daughters did not survive. Hills surround the Lake of Galilee like a horseshoe on three sides. They are about 400 metres high. The Lake itself is below sea level. Abrupt changes in temperature can occur. On occasions, strong winds sweep down without warning. The micro climate leads to violent storms and turbulent waves. One moment all can be calm and serene, the next, the Lake is transformed into a swirling vortex. This violent storm is described as ‘seismic’, a word associated with earthquakes. This was a storm with some intensity that scared professional fisherman out of their boots. The boat was swamped, the waves were breaking over the sides. Luke adds they were in great danger. The raging storm. Jesus is asleep, while his disciples are wetting their pants at the prospect of an imminent encounter with the sea bed. Whether from physical exhaustion or inner peace, Jesus is oblivious to the threat to their lives. Jesus fully human, yet fully divine. Asleep in perfect peace at rest in God. The raging storm, the peaceful Lord. The biggest storm that night did not come from the sky above or from the waves below, it was in the boat. Their Lord and Master was asleep in the middle of this raging storm and the disciples freaked out. In their panic the disciples forgot all they knew of the Lord and rebuked Him, “Teacher, don’t you care if we drown?” They must have been shouting to be heard in the wind. Matthew adds their cry “save us”. Don’t you care? Save us! Notice the mixture of faith with fear. Very human, confused and contradictory, yet surely a slur on the character of Jesus. It was they, not he, who deserved the rebuke. Jesus response is immediate, simple and awesome. A word is enough. He speaks to the wind and the waves as if they were listening, in the way you would speak to a naughty child or animal. “Quiet, be still” and the fury of the storm abated and the sea was calm. It was a miracle. Even hours after a storm has abated the sea is still choppy. But not that day. 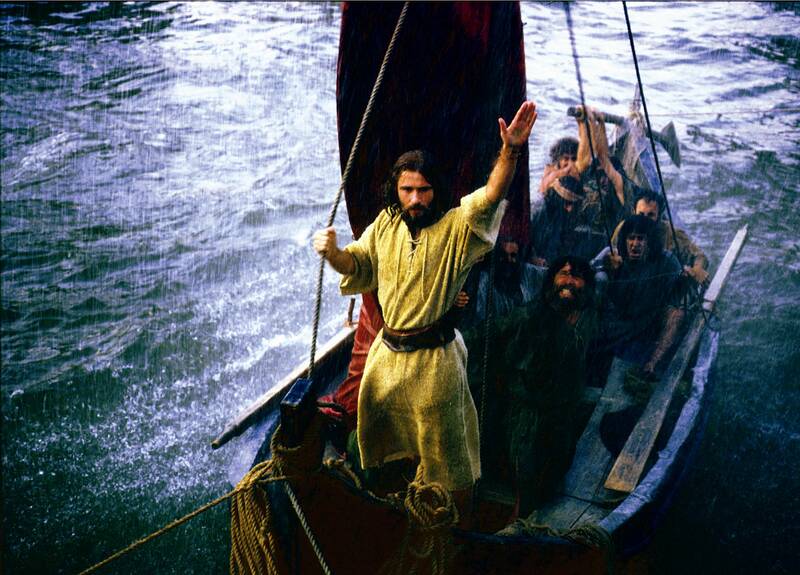 Just think about it – Jesus rebuked the wind and waves as if responsible for their actions. The inference is that this storm was Satan trying to drown Jesus before his work was accomplished. Jesus discerned under the natural phenomenon of a sudden storm, the work of the Devil. Rather than relieve their fears, Jesus multiplies them. One moment they were terrified of the storm. Next minute they were terrified because he had stilled the storm. They were unable to answer his question or their own. They had already seen him perform awesome miracles for others. They had heard the demons testify before they were silenced. They knew from Scripture that God alone has the power to control the elements (Job 38:8-11; Psalm 107:23-32). But now it had become their personal experience. The raging storm, the peaceful Lord, the faithless disciples, and the authoritative rebuke. “Why are you afraid?” This is a question Jesus asks us. Why are we so afraid? Confronted by the awesome power of God, we typically respond in one of three ways to resolve our fears. The stilling of the storm is really about psychological storms in our lives. Jesus actions are diluted to the level of positive thinking and alternative health therapy. Think about it, in a raging storm when you are about to drown, the last thing you need is a teacher. A more subtle approach? When we think we can manipulate God’s power. Of course we believe in the power of God and with the right formulas, we can replicate his miracles, or guarantee his blessing. This is common in the prosperity gospel. If you have enough faith, say the right prayers, give enough money, you will experience God’s power and blessing. The flip side is if you are suffering it must be God’s punishment. But God is utterly incapable of being manipulated by prayer formulas or positive thinking. He is, as Mark Galli reminds us, more powerful and more frightening than that. Galli says “Probably the most pervasive solution today is to completely subvert God’s power…” Bookstore shelves are lined with upbeat, hopeful, cheery books about the love of God. One example will suffice. This is how Amazon describes Embracing the Love of God: The Path and Promise of the Christian Life. the God whose love is jealous and fierce, who destroys the Egyptian army… who chastises his beloved in exile, who, incarnate in Jesus Christ, vilifies the hypocrisy of the Pharisees, overturns the tables in the temple, calms the wind and waves, and then scolds the disciples for their lack of faith… “ Of course God’s love includes “acceptance and care” but to reduce it to this should be a scandal. “In our fear of the power and glory of God, we run and throw up our little temples and sacrifice to the manageable god of our imagination. Jesus comes with might and wonder-in stilling real storms, in healing the truly blind, in raising the dead – to frighten us, and thus to save us.”. The raging storm, the peaceful Lord, the faithless disciples and his powerful rebuke. Their fear demonstrated only one thing. Faith and fear do not mix. Let me illustrate. Do you know that the WD in WD-40 stands for? [i] Water Displacement. Although oil is lighter than water, WD-40 is designed to penetrate, lubricate and displace water. Even though lighter than water, it has the ability to displace water. That is what faith in God does to fear. Like oil and water, faith and fear do not mix. There is no doubt that the Lord has the power to save us. The crucial question is how and when will he? Do we trust him with the timing and with the means? A faith that expects God to still all storms may pacify while the sun is shining, but it is naive and will be temporary. For we shall soon discover, God does not always save us from difficulties in the way that we expect or desire. When these disciples appealed to Jesus, He stilled the storm, but countless others have prayed just as earnestly and drowned at sea. Faith in the Bible simply means trust. God expects us to trust that He knows best. Is there any place for fear then? Yes, God does expect us to fear Him – fear in the sense of respect. “The fear of the Lord is the beginning of wisdom.” (Proverbs 1:7; 9:10; Psalm 111:10). Why? Because the Bible also says “For the Lord your God is a consuming fire…” (Deut. 4:24; Hebrews 12:29). This is the paradox. Let me illustrate with another analogy. If you are camping with children or arranging a family BBQ in the garden, what is your biggest fear? How do you teach your children, whom you love dearly, not to play with fire, but to handle fire respectfully without learning the hard way? You instill a healthy sense of fear because fire can burn and maim and kill. But for all its danger, we are drawn to its warmth and light especially in the cold and dark. This is what fear of the Lord is like. Respect God and everything else we fear is displaced or put in perspective, is put in proportion. God expects us to trust that nothing will happen to us without his knowledge, his purpose and consent. This is what gave the Apostle Paul the confidence to say. “And we know that in all things God works for the good of those who love him…” (Romans 8:28). Do you “know” that? Are you convinced of this? Then we will also identify with the Apostle John who said, “There is no fear in love. But perfect love drives out fear.” (1 John 4:18). Do you see that? The text does not say “perfect faith drives out fear” because it is not about me. Its not my faith that drives out my fears. God’s perfect love drives out fear. As we trust in God’s awesome, sometimes terrifying but perfect love, he will drive out our fears too. You may be called upon to face loneliness, unpopularity, bitter loss, intense suffering. But these need not frighten you because God can turn our foes into friends, he can turn our losses into gains, he can turn what appears to be defeat into victory. “This is the victory that overcomes the world…” (with all its fears and all of its terrors) “even our faith”. (1 John 5:4). With Christ in the boat, fear is never necessary or justified. You are safe in God’s arms. He will not call you home until your work is done. See your circumstances, however bleak, from his perspective; allow him full command of your situation; obey his Word and witness his miraculous intervention. If we trust God enough to put His will first, if we have no fear save the fear of disappointing Him, then that fear will banish all others as the sunrise banishes the darkness. After the tragedy of losing their four daughters at sea, in August 1881, the Spaffords set out for Jerusalem and founded the American Colony. Later joined by Swedish Christians, the Spaffords cared for the poor, the disabled, the widows and orphans of Jerusalem regardless of their religious affiliation — gaining the trust of the local Muslim, Jewish, and Christian communities. During World War I, the American Colony played a critical role in sustaining the poor by running soup kitchens, setting up hospitals and orphanages. Today the work of the Spafford family continues, serving disabled children among the poorest families of Jerusalem. Horatio also took that sentence he wrote in his diary as he sailed near the place his four daughters had drowned, “It is well; the will of God be done.” and turned it into a hymn. when sorrows like sea billows roll; whatever my lot, thou hast taught me to say, It is well, it is well with my soul.” Although Horatio in his hymn tells of the comfort that God gives, no matter the circumstance, he does not dwell on tragedy. In the third verse he directs our attention on Christ’s redemptive work on the cross, and in the fourth, anticipates Christ’s Second Coming. As we understand these things, can we too say, “It is well with my soul.”? Lord, in the storms of life, grant me the serenity to accept the things I cannot change, the courage to change the things I can, and the wisdom to know the difference. Living one day at a time, enjoying one moment at a time; accepting hardship as a pathway to maturity. Help me to trust that You will make all things right, if I surrender to your will; so that I may be reasonably happy in this life and supremely happy forever, with you in the next. Amen. This entry was posted in Bible, Sermons, Theology on January 10, 2016 by Stephen Sizer.